That’s definitely changed, especially as the average smartphone buyer places more weight on what apps are available for a phone, with less focus on the gadget’s built-in hardware features. There are still plenty of budgeting and expense tracking apps out there (and many of them are good), but now the typical mobile user can keep track of prices and save money—even on the apps themselves! 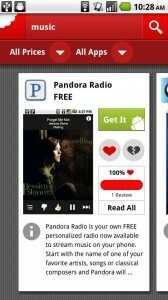 Now we have apps from the iTunes Store and Android Market that take full advantage of their respective devices’ features. 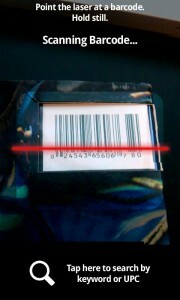 The iPhone and its Android competitors all have built-in cameras that can record and interpret product bar codes, and can of course pull information from online sources as long as they’re within network coverage. This ensures that buyers spend their hard-earned money at the right time. Listed below are five iPhone and Android apps that exemplify such frugal convenience. The first three are perfect for app hunters, while the last two help shoppers stay within budget. The best part? All five apps are free! Really love that app, but not enough to buy it at its current price? AppShopper is a must-have utility for all iOS device users, perfect for even those using an iPod touch and iPad. AppShopper tracks the prices of all items on the App Store’s catalog. It lists apps by what’s popular, new, in the Top 200 (in terms of downloads), or according to user search. Filters by price (paid or free), device (iPad-only or not? ), and category can be applied to thin out lists and help users zero in on an app that meets their specific criterion. Each app’s listing features a price history, showing how the current price relates to previous price cuts or increases. 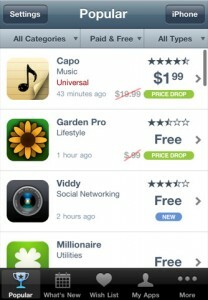 Best of all, users can add desired apps to AppShopper’s wish list, and get notified of price drops and app promos. Download AppShopper from the iTunes Store. AppBrain is like AppShopper for Android smartphones, though it does lack price history and tracking functionality. The same filters that made AppShopper so useful are also available though, and AppBrain has an additional filter that highlights Android apps that can be transferred to the phone’s SD card. Frequent users of AppBrain can take advantage of its “Recommended apps” feature, which tries to suggest apps based the software already installed on an Android device. Download AppBrain from the Android Market. This app—available for both the iPhone and Android—places less emphasis on saving money, and more on helping users get the app they really need. Like AppShopper and AppBrain it also has the always helpful free or paid filter. But Chomp really comes into its own as the first search engine designed from the ground up to process apps from the iTunes Store and Android Market. Searches return functionality-related results, instead of just items with a matching title or description. Community reviews which are curated by the Chomp team provide more accurate feedback on each app. The point? Chomp may not help you save money, but it will zero in on the app that suits your needs—making it worth the purchase. Download Chomp from the iTunes Store or Android Market. Saving money on smartphone apps is a worthy endeavor, but spending less on real-world products is even more important. Google Shopper turns your phone into a product scanner and online price research assistant. Take a picture of the actual product, and Shopper will load price comparisons for the item—listing figures from major online and brick-and-mortar retailers. See where you can save a few bucks in a snap. A few caveats: local shops are underrepresented, because Shopper only plays nice with the big retail chains. And from informal tests, it seems the app works more well with DVDs, video games, books, and albums. Download Google Shopper from the iTunes Store or Android Market. 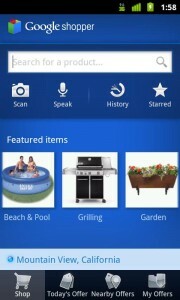 One of the killer apps that helped popularize the Android OS, Shop Savvy also has a version available for the iPhone. While Google Shopper does a great job understanding the desired product from a picture, Shop Savvy can only interpret product bar codes and QR codes. However, Shop Savvy provides more options for penny pinchers once they locate the product of choice. The app lists prices even from local shops, and supports price alerts. Shop Savvy users can also rely on the app’s new deals section, and a database maintained by the community, for even more ways to save money. Download Shop Savvy from the iTunes Store or Android Market.